With President Obama pulling out ahead of Mitt Romney in some national voter polls, it's no surprise that some right-wing partisans are resorting to tactics of pure desperation. Wild conspiracy theories and attacks on a candidate's dead mother are about as low as anyone can go — even more troubling when they attract the endorsement of a GOP official. It’s tempting to ignore Dreams From My Real Father because it’s so preposterous. 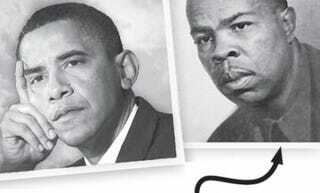 The movie claims that Obama’s actual father was the poet and left-wing activist Frank Marshall Davis, who Dunham met through her father, who was a CIA agent merely posing as a furniture salesman…. Sheryl Huggins Salomon is senior editor-at-large of The Root and a Brooklyn, N.Y.-based editorial consultant. Follow her on Twitter.